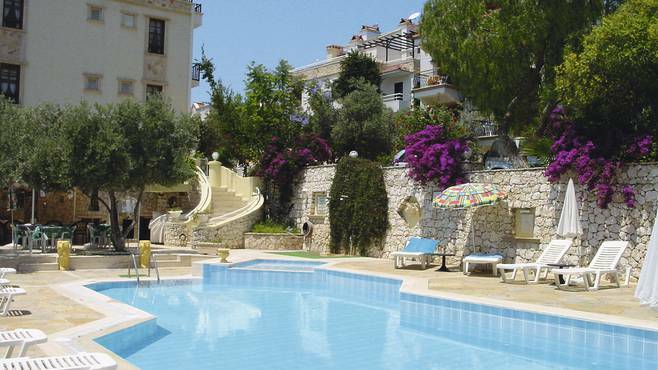 The Dionysia hotel is ideally situated in Kalkan. It is on a pretty street bedecked with Bouganvillia, it is just far enough out of the old town to provide peaceful quiet nights. Five minutes walk puts you right in the centre of Kalkan with all its shops and restaurants. The rooms and bathrooms are spotless and cleaned daily. Towels and bed-linen are changed every third day. Breakfast is buffet style and served in a sunny courtyard. Mohammed, the breakfast waiter, provides eggs boiled to your liking and toast. The staff are all very friendly and helpful. The swimming pool is well provided with sun loungers and has a good pool bar situated at one end. The hotel has many repeat visitors which speaks for itself. Air conditioning and ceiling fans are included in the price and safety deposit boxes are available. This was our first visit to Kalkan but we would certainly use the Dionysia again on subsequent visits.